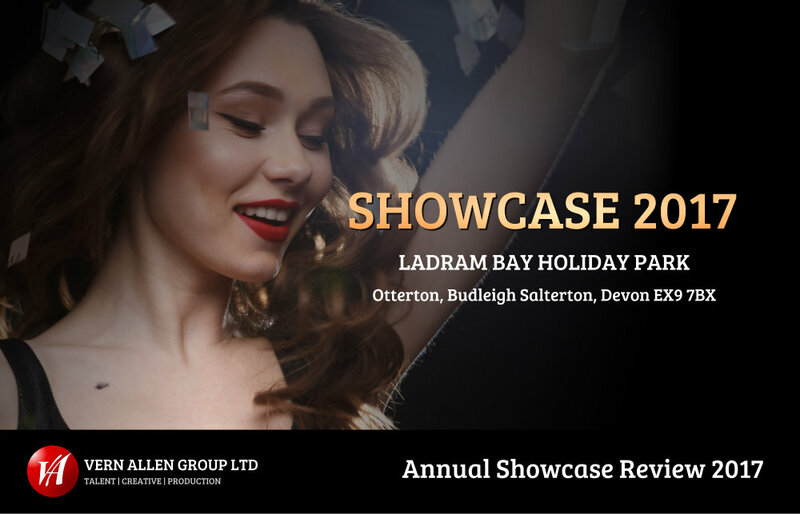 Ladram Bay Holiday Centre provided a more than adequate venue for this year showcase courtesy of The Vern Allen Group Ltd. A meet and greet show in the foyer from The Creepy Crawly Show certainly raised a few eyebrows, as did the girls from Offbeat Dance dressed as pink unicorns! Setting the initial mood in the upper bar area were THE TWERZELS, a fun-packed tribute to the West-Country’s very own Wurzels. I’m sure these boys are very popular when considering their geographical location. Lots of fun and hi-jinx. On the main stage we saw young guitar/vocalist CAMERON MILLS playing beautifully whilst we all took our seats, and what a voice! A star for the future no doubt brandishing a quality velvet like tone to his voice and an accomplished range for one so young. A superb showing. The evenings first act on the main stage was 3 piece male vocal and dance group BOISTEROUS, flamboyant in pink jackets and gold shoes, delivering nice arrangements on Bruno Mars classics. The first of a handful of acts from Bassbeatz Productions, the guys were, if I was being picky, vocally slightly lacking here and there on a couple of points but on the whole they showed massive potential and visually certainly turned a few heads. The foyer meet and greet act THE CREEPY CRAWLY SHOW was next up with a short demonstration of the stage show. Hosted by Anthony Jay who we’ve come to know as a good all-round vocalist looking very Crocodile Dundee-esque complete with an 8 foot python! Potentially this could be a great feature on any venues itinerary being both informative and entertaining with the flexibility to be used as a main stage act or as a side show. My only criticism, maybe keep an eye on the level of innuendo which could potentially ruin a great product. As tributes go, let’s face it there’s a lot of them! THE TRUTH ABOUT PINK sees accomplished vocalist Cara Bryenton displaying a huge vocal range and great costume detail. With the real Pink’s recent resurgence, I’m sure the phone will be ringing. I’m also reliably informed she is bookable as herself for solo work, something bookers should bear in mind. Another clip from our latest showcase..
Interestingly JAY RAWLINGS comes from a line of family spec act excellence, which is obvious to see as he opened by juggling a table, a chair and a vase of roses! His initial patter was a little awkward but as the act unfolded…his awkwardness was an obvious part of what became an excellent demonstration of skills. This young man is forging himself a great reputation. PAUL SYLVESTER is undoubtedly a seasoned professional, his charisma and charm was apparent from the moment the curtains opened. Impeccably dressed, Paul wowed the audience with his rendition of Unchained Melody that was greeted with ferocious applause. With soul and Motown material a given, Paul also has a Nat King Cole songbook show and a Lionel Richie songbook show, both of which I’d be keen to explore. Groups like the Overtones and The Baseballs have played a huge part in the resurgence of the 50’s style doo-wop groups…step up THE BASETONES. Nifty dance moves and solid 3 part harmony presented with a nice amount of ‘blokey banter’ should see them taking a host of bookings next year. With holiday centres, cruises and various corporates signing them up, Basetones are rapidly establishing themselves as a universally popular act, and rightly so. After success on reality TV talent shows, DUANE AJ is a confident, hi-energy vocalist with some great musical arrangements. Dressed to impress head to foot in white and already popular on the circuit this 10 minute set should only add to his popularity as he displayed huge likeability. THE SURGERY is the brainchild of tonight’s host Noel Brodie. The concept, in it’s simplicity, is the art of bringing a comedy club environment into any venue. Tonight’s comedians soon had the room in pieces and there was a definite adult style to their comedy…but then the product is aimed at over 18’s! A great idea and I’m confident this will appear all over the South-West and beyond. Traditional and Victorian styled magician ALEXANDER WELLS treated us to a beautiful twist on some magic classics. Complete with twisted handle bar moustache, Alexander was oozing professionalism and his presentation was appreciated by all. Despite a little apparent nervousness on stage, any bookers looking for a classy and different magic act should be booking asap. When you haven’t got 1500 quid to throw at a ska or madness band, bring on Joe Malik as MR SUGGS. Dressed in bowler hat and union jack tie, Joe gave us a real taste of his one-man Madness show. Interestingly he can also provide an 80’s theme show ELECTRIC DREAMS. Vocally solid, good costume and already taking dates! BASSBEATZ are a dance duo with a difference. LED’s, stunning choreography, hi-energy, UV costumes and highly proficient technique make for a brilliant and different show. Suitable for all types of venue, this visual feast will undoubtedly prove more popular during peak weeks targeting young families. Travelling all the way from the Midlands was guitar/vocalist JAKE MYLES. Impressive guitar skills and strong vocals will see Jake a popular act on the circuit. More suited to clubs and hotels I imagine and if it’s an accomplished rock vocal and guitar you’re after…look no further, dance floors will be bursting nationwide. If I could pick up on one thing…lose the chewing gum! Another act from The Bassbeatz locker is RATHER BE, a Jess Glynne tribute that on it’s day, with a good lighting system and decent PA would benefit any holiday centre or event. Nice, effortless vocals, accompanied by two 1st class dancers, this tribute has got some mileage and received warm applause. When it comes to off the wall, borderline insanity various acts spring to mind…like the band Rang-A-Tang. Take the bands frontman and the highly impressive vocals of K-Lo you get BRASS LYRICAL. There is no doubt on the impressive brass skills, but sometimes I felt they weren’t warranted. However, they are certainly different and bookers will undoubtedly want to see their full show. Closing off the night were male comedy and vocal group 2FAT4THAT. Obvious from the get-go why these guys have already got a solid diary for 2018. Quirky, original and fresh, there’s nothing like this out there right now which only adds to their popularity. Excellent harmonies and a whole bundle of personality, however one of the group in particular must be careful on ‘over-doing it’ as the impressive vocal element is sometimes lost in-amongst the ‘action’. That said, it was a superb set. To open the second night we had another feast of meet and greet acts including a wrestling company, a nice unplugged MTV style duo called STRINGS AND ROUNDABOUTS, stunning close up magic courtesy of ROB HENDY and GARY JONES, both of which are 1st class slight of hand magicians and also those pink unicorns again from OFFBEAT DANCE, ushering people through the main doors. Whilst taking our seats this time we were introduced to young singer/songwriter HOLLY MORWENNA. Well, words escape me, this young lady is simply world class. Already recording original material and albums, Holly is without doubt a recording star of the future. Her vocal is pure, her guitar skills were solid and on the whole I was highly impressed. Any record labels looking for young talent need look no further. To open the main show, we were greeted by MATT EDWARDS, who recently finished 4th on BGT and was Ant and Dec’s golden buzzer award! 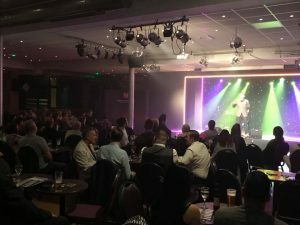 As daft in real life as he was on BGT, Matt quickly sprang into action as tonight’s MC proving himself to be a quality entertainer and worthy of his recent success. 1st up were Bristol based S.A.M.S. BAND, with a slightly less ordinary line-up of vocals, keys, guitar and sax. A tidy 4 piece with a nice repertoire, they should raise interest from most holiday centres and club venues. Fronted by experienced female vocal Sharon Stanton, they were hindered by a freak breaking of 3 guitar strings, but they were still able to show good booking potential. As magic goes you’d have top be doing something quite unique to be different these days. JAY AND JOSS have obviously put some thought into their presentation and strived to produce something different. A lot more from these boys to come I’m sure. You can’t swap any sort of money for experience! THE AMBASSADORS DUO ooze professionalism with an old school approach that is actually quite refreshing in today’s modern world! Able to ply their musicianship to background/cocktail music, ballroom/sequence, MOR, Soul and Motown, the list goes on and on. Highly versatile, huge repertoire, great vocals and very bookable. CAZ KRELLE is the ultimate modern-day cabaret act. A seasoned performer and a classy musician, Caz is proving to be a go-to act for many holiday centres and venues across the country. Her vocal is superb and is only equalled by her excellent piano and guitar skills. Style and panache come as standard. CHRIS TENNANT is out to prove that mind-reading is an accomplished skill and from what we saw there’s a little bit of work to do but potentially this has the makings of a great act. Clients looking for something a little different should show some interest. Next up, a brand new offering, THE ALL SEASONS, a tribute to The Jersey Boys and Frankie Valli. Looking sharp and pulling off synchronized dance moves there’s obviously a lot of work gone in on presentation. Intricate harmonies laced with the classy falsetto were as good as you could expect and I’m sure once the four of them spend a bit more time together this will challenge any Jersey Boys show. In the country right now there’s stiff competition but there’s room for these guys to assert their place. Comedy is often difficult at the best of times but DAVID ARNOLD struck the right chord right from the off. A good, solid topic base and good delivery saw David get a great response from the audience. Stand-up comedy still has a place in the market and David was quick to reiterate that. A solid set. THE ELECTRIC THEATRE exploded on to the stage with a powerful and hi-energy version of Pinball Wizard. Backed with complex 5-part harmonies, incredible piano skills and showmanship galore, this show would be best suited at corporate events and larger holiday centres. Ending the spot prematurely due to an error in communication, you felt there was even bigger routines to come from this 5-piece act, although the audience greeted even the false end with a tidal wave of applause and appreciated the set…and the grand piano! Male/female duo’s are two-a-penny these days and again, you’d have to be doing something different to stand apart from the competition. THE CRAVING do this with aplomb serving up delicious rock anthems from the 60’s and 70’s combining awesome guitar skills with equally as classy vocals. I would imagine most holiday centres, pubs and clubs will show interest here. I do love a good unique spec act so I was pleased to witness CIRCUS BERZERCUS. A mad-capped, skill-packed, masterclass in street theatre. Unicycling, juggling, mime, comedy, audience participation and a genuinely funny story line…and that was in just 10 minutes…well 16 actually…but on this occasion the over-run wasn’t an issue, but they must be careful there’s not too much idling to get to a punchline. These guys will have raised significant interest across the board and the diary should be bulging. STRINGS AND ROUNDABOUTS, after showing off their unplugged set were now able to demonstrate their full cabaret style show. It’s as daft as it is packed with energy. Great fun to watch, anthemic song choices and quirky personalities make for a great act. Ticking off the old school rota is accomplished magic man GARY MAC. As a pro magician, Gary was very slick and so was his pink suit! His comedy one-liners could do with a little updating here and there but on the whole a very nice spot. Male vocalists sometimes have a habit of churning out the same old songs so unless you have something incredible to offer as a side-line, there’s sadly not a lot you can offer to stand out…unless you do songs that no one expects…enter SAM WREY. A good strong voice and a seasoned entertainer he carries an interesting repertoire and is easily bookable…one point to note and it’s not a life-changer…maybe take a second opinion about stage-wear. Rock songs seem to be facing a resurgence in recent times so when CRYSTAL THORNE entered the stage, complete with a racy all-in-one body suit, you knew rock was on the menu! She worked the stage nicely and laid down a solid 10 minute vocal. Strong and well-presented backed with a very likeable demeanour she should see good interest. Another brand new act is solo male vocalist JOE STONE. An interesting, on-purpose, awkward humour is only a catalyst for a solid vocal. Leaning more towards older, classic material, Joe certainly picked up the crowd and allowed his personality to further enhance the vocal performance. One small teeny tiny point is talking is great, if it has a purpose and a direction. Some acts get caught in no-mans-land and Joe was close occasionally but skilfully dug his way out. There will be work offers here no doubt. Closing the showcase tonight was vocalist MATT BAKER and after a brief outing on BBC’s The Voice, he has been inundated with work offers. Vocally his range is superior to most and his phrasing is excellent. 2018 could very well be Matt’s busiest year yet, this West-Country boy can certainly sing!